The Art of Botany looks at the cross-pollination of art and plants, uniting artists and naturalists into dialogue. This program will feature three Knoxville-based artists and creatives, Margaret Scanlan, Norman Magden, and David Denton, who collaborated on the multi-media, experiential work, “Poppy Project,” at the Knoxville Botanical Garden in 2016. Local therapist, herbalist, and naturalist Holli Richey will respond to their work, speaking on the cultural use and medical history of poppies. Join us for a fascinating discussion on the generation of creativity by, and healing from, the humble plant. In partnership with Crabtree Farms of Chattanooga, TN, I will be leading a Forest Bathing experience. Contact (in advance) Crabtree to register. Forest Bathing, also called Shinrin-yoku, is a Japanese concept of immersing oneself in the rich sensory experience of the forest with open awareness and no expectations. 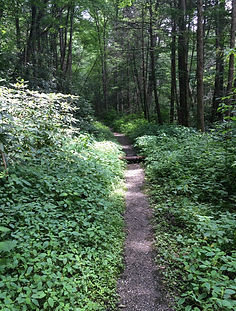 The body and mind “bathes” in the smells, sounds, light, movement, taste and feel of the forest. Through mindful experiences such as Forest Bathing, we can be present with the body and senses, simply resting in natural awareness, grounded. We will practice skills in how to work with difficult thoughts and feelings to reduce stress and anxiety. Research in Japan is providing evidence of what nature-lovers have intuitively known for years: that reconnecting to the forest will heal us. Studies show, specifically, that intentional forest walking elevates the mood, reduces stress hormones such as cortisol, boosts the immune system, and reduces the heart rate.